With itslearning, we saw a platform where we could truly implement the three principles of UDL. The new Every Student Succeeds Act (ESSA) for K-12 education specifically endorses Universal Design for Learning(UDL), a set of principles that require teachers and students to shift roles as they collaborate around student-driven learning paths. It’s a significant departure from the traditional classroom approach, and transforming a learning environment doesn’t happen overnight. To help schools navigate the sea of change to more personalized learning, itslearning, developer of the award-winning itslearning learning management system, has published a new guide titled “How To Make Personalized Learning a Reality in Your District.” The 18-page PDF explains the stages and steps to creating a learner-driven environment powered by the UDL approach, how technology can support the integration, and questions to ask when considering which learning platform to choose. It likewise includes examples and tips from school districts that have successfully implemented a comprehensive plan to transition to student-driven learning. 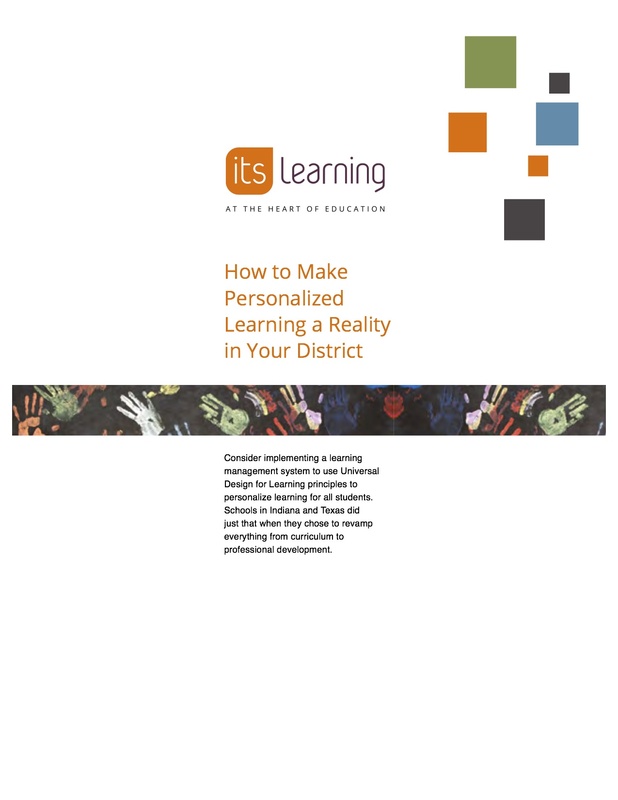 “How To Make Personalized Learning a Reality in Your District” begins by explaining the distinction between “personalized” and “individualized” learning, and the benefits of encouraging students to be co-designers of their own learning paths and curriculum. It discusses the ULD model of “access, engage, express,” and provides educators with a framework for understanding how to create curricula that meet the needs of all learners. Finally, it provides tips to transition UDL from theory to practice, and examples of how learning management systems such as itslearning can be used to provide a streamlined, user-friendly learning environment that simplifies student-centered learning. Designed for teachers and how they want to teach, itslearning is a cloud-based learning platform used by millions of teachers, students, administration staff and parents around the world. It can be found at all levels of education, from primary schools to universities, helping teachers make education more inspiring and valuable for today’s students. Established in 1999, itslearning is headquartered in Bergen, Norway, and has offices in Boston, Atlanta and multiple locations around the world. For more information, visit http://www.itslearning.net.